I have already lost my colors when moving to Lion on my Terminal.app, the same happened when I moved to Mountain Lion, but oh surprise, the fix I found out for Lion didn’t work for Mountain Lion, because in Mountain Lion there is no xterm-color available as a choice of terminal type. The solution I found was to manually edit the configuration options of Terminal.app and so far it seems to work. which will open the Preferences folder in Finder and you can just find the config file and open it. 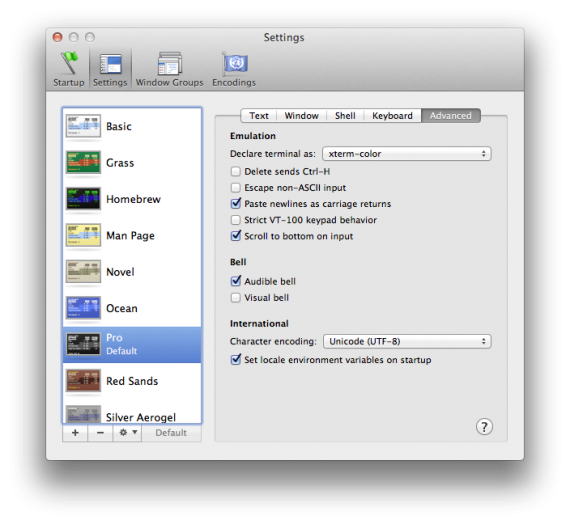 Before doing any edits you should quit Terminal, as it saves its settings on exit and it will override any changes you do. To add the xterm-color option you’ll have to go to Root > Window Settings locate the name of your default theme (in my case that’s Pro) expand it and find the TerminalType key. Now just change the key to xterm-color, save the file and launch Terminal. As I’ve always strived to automate my home, as much as I can. Although I can’t still turn the lights on and off, I’m capable of controlling my TV, my set-top-box and my multimedia PC with my iPhone. And the problem with the lights is not so much of “impossible” but rather I don’t feel like tearing down my laws to run cables. I actually managed to write an app for a friend to turn his garden lights on and off with his iPhone. This seemed to work for me, even after I restarted the App. Since WordPress updated their iOS app to include location for posts, it came to my attention that it is fairly easy to add location to your posts – and it works nicely with the “Quick Photo” feature of the iOS WordPress app. Unfortunately after I installed the WordPress GeoLocation plugin OnSwipe’s iPad theme stopped working for me. After some digging it turned out it is because Geolocation is overwriting the default alias of $ of jQuery which was breaking OnSwipe. This should fix OnSwipe and at the same time allow your visitor to view the location tag of your posts! Ubuntu 11.10 is out! So the package manager prompted me to upgrade from Ubuntu 11.04 and so I did. The upgrade process took several hours, but mainly because I wasn’t paying attention and I didn’t take immediate action of different prompts regarding the upgrade process. I decided to keep all of my config file modifications hoping that would give me less headache at the end. Nevertheless, I got several problems after I booted in my new shiny Oneric Ocelot (Ubuntu 11.10’s codename). I didn’t get any sound in Unity, but only in Unity as it turns out, as aplay was playing sound just fine. The sound preferences’ Hardware tab was also completely empty. I deleted the ~/.pulse folder and re-logged and I could re-configure my sound. Sound was back on! I’ll keep this post updated if I come across more problems, and hopefully their solutions. Reopen Terminal.app and voilà – the colored SSH command prompt is back! Честит празник (на патерица) на всички, които могат да прочетат това. От няколко години насам, по случай 24 май, много се чепка темата за кирилицата, шльокавицата и произвдните им азбуки, които средностатистическия българин употребява. “Младите”, които използват компютри са упреквани, че си развалят езика и нямат правопис. Често се набедяват популярните програми – фейсбук, скайп (я вижте как хубаво изглеждат тия търговски марки написани на кирилица) и т.н.. Но дали те са причината? И двата софтуера имат “меню на български”. А именно “менюто на български” е причината да пишем на латиница. Разгледайте обявите за телефони от преди няколко години – като част от “екстрите” на телефоните неотменно присъства “меню на български”. В 2011 почти всички телефони имат въпросното меню и способ да се пише на кирилица, но до преди няколко години това определено не беше така. Същото се отнася и за компютрите – голяма част от софтуерните програми нямат “меню на български”, а до преди излизането на Уиндоус Виста, дори и сносна кирилица нямаше! Тази по БДС не се брои! Защо? Ами защото за някой, който тепърва започва да работи с компютър не може да намери БДС еквивалента на клавиатурата, защо такъв няма, защото държавата е допуснала да се продава в рамките на държавата продукт, който не отговаря на националните изисквания, а именно – не поддържа националния стандарт за клавиатурна подредба с обозначение на клавишите на кирилица. От тук всеки започва да ползва подредбата ЯВЕРТЪ – тук поне буквите ги има, а тази подредба я има поне от края на 80-те години! Т.е. проблема с БДС подредбата на клавиатурата не е от вчера. И така хем няма клавиатура с БДС, хем няма фонетична подредба в най-масовата операционна система! От там, започва да се ползва и латинската азбука за писане на български. От скоро имаме и фонетична подредба, заложена системно в по-новите версии на уиндоус, но това не означава, че навика отмира трудно – даже напротив. В един момент започва да става дразнещо да превключваш от кирилица на латиница и обратно. А това се налага често, понеже всички интернет адреси са на латиница! Заключенията, кой е виновен за слабата грамотност оставям на вас. Извинете ме за правописните грешки, но за мен езика е средство, а не самоцел. I’m using devise for authentication and authorization and using devise built-in controllers. My User model has a child Contact model (Contact belongs_to :User) which contains the user’s names and contact information. I preferred not to initialize the content model on new registration in the view (what’s the point of MVC philosophy if you don’t follow it?). 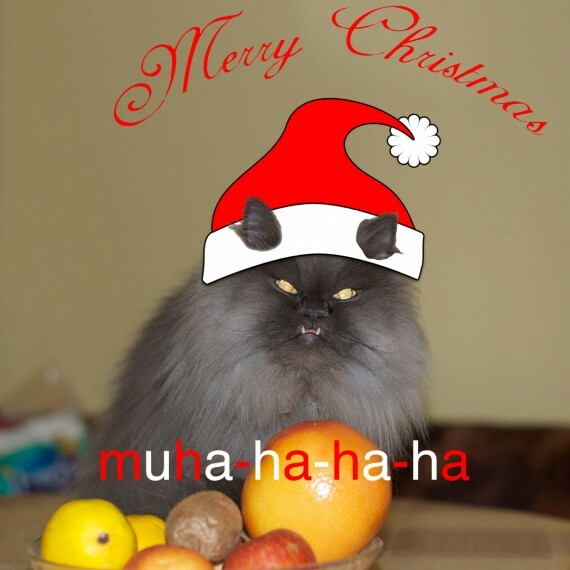 Merry Christmas from Puffy – the destroyer of worlds! In my line of work as a web designer/developer I’ve learned to silently detest Internet Explorer, especially version 6, so today I decided to check out the analytics of my web sites, how much of the visitors would I be cutting off if I decide to drop IE6 support for the future. I checked several sites – totally different audience, markets, etc. All showed about the same result – 7% of all total visitors were using IE6, and IE6 was the least used of the IE family. Except for one site which had about 9.6%, but it was targeted at the wider Bulgaria population – demographics that I presume has mostly outdated hardware running XP’s. I was delighted to see kirichkov.com’s demographics – IE was third, after Firefox and Chrome, with just about 11%! IE6 accounts for just 1.5% of the visits! Yes! This site looks awful in IE6, and NO! I don’t care, if you’re visiting with IE6 you’ll see a friendly greeting informing you that kirichkov.com does not support IE6 and the visitor should upgrade! Also the dominant OS of the visitor is … Linux! Even more joy for my web designer heart! But then again I’m not really surprised, given that 65% of the visits start at my article for ZoneMinder on Ubuntu 10.04! I surely hope that sometime soon I can get back to my ZoneMinder project and present to you part 2 of the series that will turn the video server into a CCTV terminal! Please note: As of writing this cambozola version 0.76 is the latest one, hence if you get a newer version you should change to the respective directory. How to calculate that magic number (256000000 in my case) is discussed in this thread in the ZoneMinder’s forums. It’s best to read it and calculate the amount yourself, as this is highly dependent on the cameras that you intend to use. In order to add the change permanently you’ll need to edit /etc/sysctl.conf and add a line kernel.shmmax = 256000000 to it. If you are still getting no image you should check your cameras and how you set them and experiment with the Device format and Capture palette. It might be a good idea to slightly tweak some configuration options. You can do that from the Web Interface’s options menu – it is located in the upper right corner, just below the load/disk-usage monitor and it took me quite a while to find it. I plan to implement also a Live View monitor so stay tuned for the next HOWTO.